There are quite a few airlines operating flights to Harare from London and other UK airports. Travelers have their own preferences while choosing a specific airline for taking a flight between different airports of the UK and Zimbabwe. Popular among them is Emirates, as leading choice due to its availability of multiple departure airports from UK and no doubt, being number 1 airline of the world is most compelling and deciding factor among flight seekers for Harare. But a little longer journey with Emirates flights to Harare is an irritating factor for some travelers who wish to reach Harare in a shortest possible flight journey. Here comes the Ethiopian Airlines and Kenya Airways, most popular airlines originating from Continent Africa and both of them offer shortest possible flight between UK and Harare. South African Airways is another airline which is pretty popular among those travelers who are regular travelers to Harare but are willing to have a stopover in Johannesburg. British Airways and Virgin Atlantic are other choices for such travelers because both offer flights to Harare via Johannesburg as well. Unfortunately, no direct flights are currently being operated between UK airports and Harare International Airport. Besides, Air Zimbabwe used to fly direct for many years between London Gatwick and Harare International Airport and captured the major share of travelers to Harare but seized its operations due to many reasons in 2012. How long is the flight to harare ? When is the best time to book flights to Harare ? Keeping in view the high season (spring and winter) , cheap tickets to Harare are not easily spotted due to a large number of travelers heading to Harare. Many British-Zimbabweans move to their home country during the UK holiday months starting from March and lasting up to July. Therefore, we recommend you to book flight tickets to Harare in advance to be sure about confirmed seats at an affordable price. We are also offering special flight deals to Harare for those travelling in Mid April to June 2019 and then from September to November 2019. Booking flights at least three weeks prior to your flying time can easily get you cheap flights to Harare from London Heathrow and other regional airports in UK. People who prefer favourable weather conditions consider spring and winter to be the best time to visit Harare. The months of April to August are particularly regarded as the peak season for sight-seeing in Harare as it sees minimal or no rain at all. It is, again, advisable to book in advance for these travel busy months. Travelhouseuk team works dedicatedly to get low-cost airfare deals from major airlines. By this means, we enable ourselves to facilitate our clients to enjoy peak season but with reasonable flight prices. Moreover, you can subscribe to our newsletter to find an ideal summer flight deal or Christmas flights to Harare in December 2019 from major UK airports. When is the cheapest time to travel to Harare from UK ? You can plan to visit Harare in February, May, September, and October if you are looking for cheap flights to Harare . Normally these are the months when airlines offer deals from UK to Harare due to less traffic. Find the cheapest flights to Harare by booking in advance. If you want to spread the cost of your flight tickets to Harare, then agents can facilitate you with the fly now and pay later flights. Can i book flights from Harare to London as well for my family? Travelhouseuk, your online travel portal, gives flight offers from Harare to the UK as well. Just let us know the proposed travelling dates of your family, we will book, issue airline tickets and will look after until your loved ones arrive here in UK. Can I Get A Better Deal For Last Minute Flights To Harare In July ? You might not be lucky always when planning for the last minute flights from London to Harare. July is still a busy season to take a trip from the UK to anywhere in Africa. Harare is one of the most travelled flight destinations from the UK. Travelhouseuk always advises all travellers to book in advance if planning to fly in July or December 2019, being the busy holiday season. However, you can still give us a quick call and check with our experienced travel consultants, and they might even be able to get a bargain deal for you. Airlines which departs in the evening from London to Harare ? Kenya Airways and Ethiopian airlines depart just after 1700 from London Heathrow. Emirates and South African airways leave around 2000 from London to Harare . How many flights does Emirates operate to Harare from UK on a weekly basis? Emirates is currently operating daily flights from London Heathrow, London Gatwick, Manchester, Birmingham and Glasgow to its hub in Dubai. From Dubai onwards, a connecting flight to Harare departs every day. If flying with Emirates to Harare, which UK airport should one choose for in order to save time spent on a stopover? London Heathrow has the least stopover time when it comes to availing return flights between UK and Harare, with a stopover duration lasting 1 hour and 45 minutes in each direction. If availing one-way flights from UK to Harare, choose Glasgow Airport for your departure, because these flights make a stopover of only 1 hour and 15 minutes at Dubai International Airport. Kenya Airways operates daily flights between London Heathrow and Harare. South African Airways offers flights from Heathrow and Manchester on daily basis as well. Ethiopian Airlines flights only depart daily from Heathrow Airport. British Airways operates Harare flights on daily basis from Glasgow, Manchester and Heathrow Airports. Emirates Airlines also gives you choice in selecting your nearest airport for Harare flights. Its daily flights are available at Heathrow, Manchester, Glasgow, Birmingham and Gatwick. How can i book flights from Harare to Bulawayo or Victoria falls ? Travelhouseuk does not only assist you in booking cheap tickets to Harare but you can also book flights from Harare to Bulawayo or Harare to Victoria Falls or any other destination within Africa or worldwide with Travelhouseuk. Just give us a call and our travel experts will book domestic flights in Zimbabwe it for you. 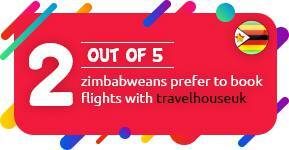 Why choose Travelhouseuk to book your flight To Harare? Travelhouseuk served more than 38000 families last year travelling from UK to Harare. Going to Harare for the very first time? Let our Harare experts make your trip worthwhile. Best negotiated airfare deals with most of the airlines operating flights from UK to Harare. Cheapest fare to Harare is guaranteed. We have special flight deals for inbound travel from Harare to London available all round the year. Save time and effort consulting our Harare flight experts who will assist you with tailor-made packages for Harare specifically for you. You're always in good hands as we not only give assistance in completing your bookings but during your travel as well. Regardless the purpose of your trip, baggage allowance is a major deal maker or breaker when choosing a particular airline for your trip. We not only book cheap flights from London to Harare but we also pay close attention to free baggage allowance so you may carry as much you require. Most travellers prefer a cheap airline that offers a larger baggage allowance. Amongst other airlines most preferred is the national airline of UK i.e. British Airlines which offers a bag of 23 kg for Economy Class travellers and 32 kg for their Business Class customers. Other notable airlines of the continent of Africa namely South African Airlines and Ethiopian Airlines also allow their passengers to carry the same amount of luggage. Emirates is the most favourite airline, you are allowed to take 35kg in Economy Class (depending on fare type), 40kg in Business Class and 50kg in First Class. Harare has plenty of guesthouses, safari lodges, budget and luxury hotels available. All of these options can be found in the city center and commercial areas. Some of them boast a swimming pool, Wi-Fi, spa, hotel and sports facilities. Few international hotel chains are also offering services in Zimbabwe capital. If you are on a business trip, you can opt to stay in hotels located in the commercial zone. These hotels have furnished rooms with en-suite bathrooms. Business travelers can also stay in guesthouses. Some of which also offer breakfast included in the price. Hostels and backpacker lodges are also available in the city. The most favorite accommodation option for backpackers is the Small World Backpackers Lodge which is located near the Avondale Shopping Centre. National Gallery of Zimbabwe: The exhibits at the gallery showcase classic and contemporary African art. National Gallery Zimbabwe has stone sculptures, carvings, photos, masks, and paintings. It is located in the Harare Gardens. There is an excellent book and crafts shop attached to the gallery. Epworth Balancing Rocks: These rocks are located in the southeast of Harare in Epworth on 13km drive. The Epworth Balancing Rocks are more popular than other balancing rocks in Zimbabwe as they have appeared on country's currency notes. Mukuvisi Woodlands: This natural reserve is best for watching giraffe, ostrich, elephants, and impala. It is located just 7km away from the city center. You can view either from the platforms, on foot, horse safari or on a bicycle. It has also some endemic bird species. Using car hire services to travel around Harare is highly recommended for travelers. Always travel in large groups, especially at night. Always ensure your travel insurance before traveling for immediate health services in foreign land. Refrain from exposing expensive goods or large amount of cash in public places. The summer over there is our winter and the coolest months are: May, June and July over there. These months are also the most pleasant time of the year to visit. Internet/WiFi services are available at hotels, but you may notice the service to be slow and interrupted at times. Cell phone coverage is good throughout the city but, International landline calls are still unreliable. Most of the purchases in large stores and malls are done with US Dollars. Also, major currencies in the world can be used such as GBP, Euro and etc.